Looking from the docks toward town. There is a Beaufort SC I already wrote about, then there is this Beaufort. Of course they are pronounced completely differently, otherwise how could you tell them apart? 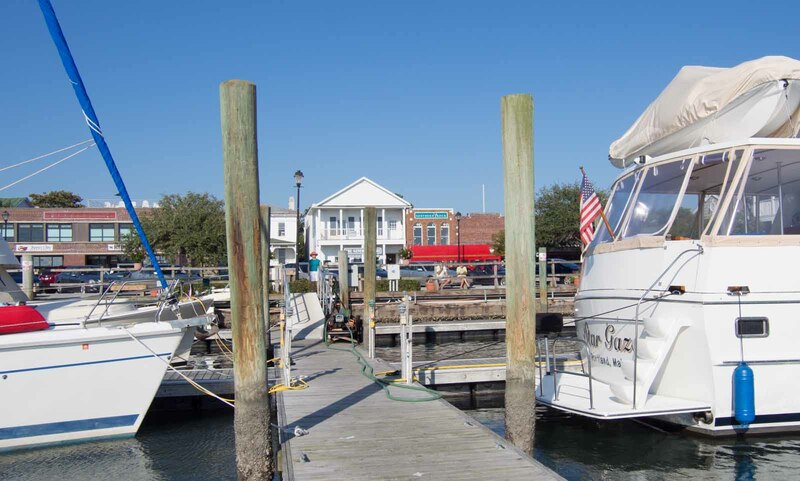 We’re here at Beaufort Docks marina, right downtown. Sunday is our 2nd day here. There are a number of shops, old early 1800 buildings and restaurants right at the waterfront. We walked a block to the Methodist church this morning and spent much of the afternoon in the North Carolina Maritime Museum one block away along the waterfront. We learned a lot about the area’s favorite son, Blackbeard the pirate. As we approached the Gallants Channel Drawbridge just a mile from our marina the channel right in front of the bridge was literally carpeted with small boats from rowboats to small runabouts. Apparently the fish bite really well there. There was no straight path to the bridge and its hourly scheduled opening came in a few minutes. The only path through was off near the edge of the waterway then hard left across half the river through the middle of the swarm and then hard right before I ran over several of them just past mid channel. Sue stayed in the back watching that I did not hit anyone in that area as I kept the boat positioned to get under the bridge when it opened. If our boat was any larger we would have been stopped completely. I kept the radio handy in case someone was on the other side of the bridge. I had to come through first because I had nowhere to move but forward and there was no place for a boat of any size coming through the other way until I was out of there. We’ve certainly never seen anything like this. Later I called the coast guard and told them about the situation. They said to call them if I see that situation again and they’ll come and clear them out. They’ve done it many times in the past. And then I wait an extra hour for the next opening? After we were through Sue took a picture. A few small boats but nothing like the other side. I would have taken a picture of that situation but was too busy trying not to run over anyone. We leave tomorrow morning early and will try to get through 4 “scheduled” drawbridges. Two open every hour and the other two every half hour. I think we can time it so we don’t have to wait too long at any of them. One of these is the Surf City swing bridge that I had some trouble with on the way up. I’ll be more careful this time. With all these scheduled bridges we are still taking it easier than when we came up. If we like a place where we stop we stay an extra day or two. If it is not too interesting we move on. Depending on the scenery our speed may drop. It’s a great way to travel if you’re not in a hurry.